The School of Social Work is among the nation’s top schools for those who want to earn a degree through an online MSW program, according to Social Work Degree Guide.com. UT Arlington’s online program ranked No. 12 out of 25 online MSW programs that are accredited through the Council on Social Work Education. The CSWE is the only organization that provides accreditation for all 254 Master’s in Social Work programs. Of the School of Social Work’s more than 1,100 graduate students, 380 are enrolled in the online program. Read more about the School of Social Work honor. Effective this fall semester, UT Arlington will begin charging students tuition and fees separately. Previously, the charges had been combined into one comprehensive billing. The University is improving its billing services in this regard to increase transparency so students and parents can see clearly what they are paying. You will see this change when you log in to MyMav to view your financial charges and payments. Most students will not be affected by this change. Students who receive a tuition exemption and/or waiver or whose tuition is paid by a third party organization may see a change in charges. If you qualify for a specific state exemption or waiver, review the program coverage at the View Waivers and Exemptions website, as certain exemptions may cover only tuition and/or specific fees. Sponsored students should contact their sponsor to confirm their exact coverage under their specific program guidelines. For questions concerning the new presentation of tuition and fee charges, contact the Office of Student Accounts (formerly Bursar Services) at 817-272-2172 or studentaccounts@uta.edu. 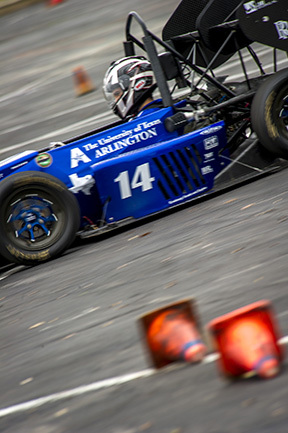 The UTA student Formula SAE racing team will host at least a dozen teams from across North America for the 15th Annual Texas Autocross Weekend Friday-Sunday, July 17-19, on the UT Arlington campus. Bob Woods, adviser to the Formula Society of Automotive Engineers student racing team and professor of mechanical and aerospace engineering, says this year’s event features about 30 student-built race cars. Each year, students from across campus converge in Woolf Hall to design and build a formula race car from scratch. 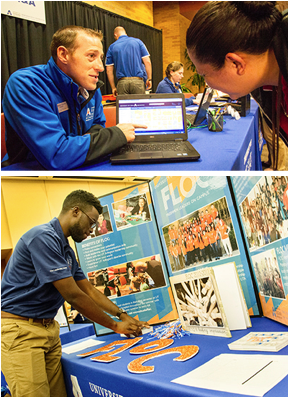 Most students are from the College of Engineering, but some have hailed from architecture, liberal arts, and other schools and colleges at UT Arlington. The UT Arlington team previously has been ranked No. 5 in the world and No. 1 in the United States. The UTA team will host an open house at 3 p.m. Friday, July 17, at the Arnold E. Petsche Center for Automotive Engineering in Woolf Hall's southeast corner. Competition starts at 9 a.m. Saturday, July 18, and 10 a.m. Sunday, July 19, both on Lot 49. Read more about the Texas Autocross Weekend. Top, David Duvall, left, director of New Maverick Orientation, gives Mary Campbell directions to Davis Hall at a recent orientation. Her son, Jaeln, will be an accounting freshman in the fall. Bottom, Ashford Sonii, architecture junior, sets up the Freshmen Leaders On Campus display for the Involvement Fair, part of orientation. Sonii is a FLOC student adviser. Student Legal Services will close permanently after Friday, July 17. Students who used Student Legal Services may obtain their files in Suite 216 of Davis Hall. To pick up a file, send a request to legalservices@uta.edu by 5 p.m. Wednesday, July 15. Identification is required when picking up a file. For questions, email legalservices@uta.edu or call 817-272-3771. The UTA Maverick Marching Band is looking for students to perform with the 2015 UTA Color Guard. The performing ensemble will be under the direction of Karen Blake, director of Brenham Independent Winterguard, the 2014 WGI Independent A Class Silver Medalist. Student parking permits will be $165 per year. An hourly meter rate is set at $2.50. 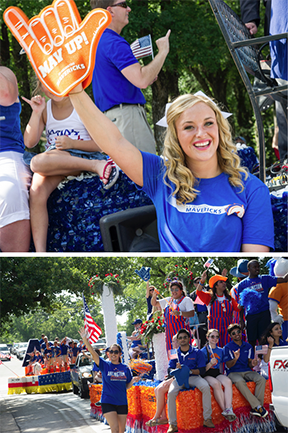 Patriotism and UT Arlington pride were on display at the 50th annual Arlington 4th of July Parade. UTA’s entries included two floats, as well as the University’s spirit groups and Formula SAE race cars. See more photos. For questions about Title IX, contact Eddie Freeman at efreeman@uta.edu. More than 600 participants, judges, and law enforcement officers from around Texas will be on campus Thursday-Sunday, July 30-Aug. 2. The Texas Law Enforcement Explorer Advisors Association's State Explorer Competition features teams of youth and adults competing in 20 different “real-life” law enforcement scenarios over a two-day period. The scenarios will take place in various campus locations including parking lots, classroom buildings, the University Center, and residence halls. Questions? Contact the UTA Police Department at 817-272-3381. Priority registration for summer II and fall terms continues. Advising is available in your academic department. Examine the design and style of decorations on African masks in the exhibit Ornament and Adornment: The Decoration and Application Techniques of African Masks. The masks are on display in the Visual Resources Commons, Room 2109 of the Fine Arts Building. 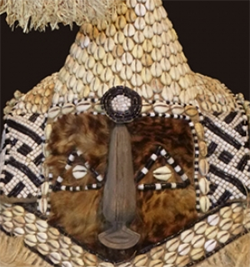 Mask materials include iron nails, tin appliques, shells, beads, plant fibers, hair, leather, pigments, and resins, all with cultural significance. Pinned, stamped, tied, woven, painted, and carved, these embellishments were meant to accentuate movement, replicate human characteristics, and evoke meaning as they heighten the viewer's experience of performance and ceremony. The works are selections from the Dowdey-Campbell and Brodie African Art Collections in the Department of Art and Art History. Gallery hours are 8:30 a.m.-5 p.m. Mondays-Fridays. The exhibit runs through Aug. 31. Free Outdoor Movie: 'The Breakfast Club' (1985) Bring a chair or a blanket, a picnic, and friends for outdoor movies each Thursday. Free popcorn. Upcoming movies are Pitch Perfect 2, July 23; Dirty Dancing (1987), July 30; and Tomorrowland, Aug. 6. Free. 9 p.m., lawn behind the Maverick Activities Center. EXCEL Campus Activities. Discount Rangers Tickets Texas Rangers vs. New York Yankees. Visit texasrangers.com/grouptickets, click on University of Texas at Arlington, and use the password GOMAVS to get your discounted tickets. Various times, Globe Life Park. Upcoming games are Houston Astros, Aug. 3-5; Tampa Bay Rays, Aug. 14-16; Seattle Mariners, Aug. 17-18; Toronto Blue Jays, Aug. 25-27; Baltimore Orioles, Aug. 28-30. Texas Rangers. Safe Zone Ally Training Learn how to be supportive to lesbian, gay, bisexual, transgender, questioning, and other sexuality and gender identity community members. Free. 1-4 p.m., Red River/Concho Rooms, E.H. Hereford University Center. LGBTQA Program. UTARI Seminar Susan Juarez, right, UTARI grant writer, discusses Small Business Innovation Research/Small Business Technology Transfer funding mechanics. Register online. Shuttle available. Lunch provided. Noon, UTARI, 7300 Jack Newell Blvd. S. UT Arlington Research Institute. Arlington Technology Association Shih-Ho "Simon" Chao, civil engineering associate professor, provides a brief history of concrete, describes factors contributing to its strengths and weaknesses, and reviews recent developments in improved concrete composites. Light breakfast provided. RSVP. Free. 7-8 a.m. Wednesday, Aug. 5, Room 100, Nedderman Hall. Arlington Technology Association. The women’s basketball team has released its 2015-16 nonconference schedule, which includes three opponents that reached the 2015 NCAA Tournament. The Mavericks tip off Nov. 13 at Baylor, which advanced to the Elite Eight last year, in the Women’s National Invitation Tournament. The nonconference schedule also includes home games against 2015 NCAA Tournament teams Seton Hall on Nov. 24 and Western Kentucky on Dec. 13. 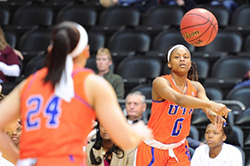 UTA finished last season 17-13 overall, posting the largest turnaround in NCAA Division I. See the 2015-16 schedule. Golf coach Stuart Deane has qualified for the 2015 United States PGA Cup Team, which will compete Sept. 18-20 in San Martin, Calif. He earned a spot on the 10-player team for the first time based on a two-year rolling points system. The U.S. is facing a combined team from Great Britain and Ireland, with the prestigious Llandudno Trophy on the line. Deane recently participated in the PGA Professional National Championship at the Philadelphia Cricket Club. Former UTA All-America guard MarQuez Haynes has signed a contract with Italian champion Dinamo Sassari for the 2015-16 season. Haynes, 28, spent last season with Maccabi Electra Tel Aviv, his second full Euroleague campaign. He averaged 4.6 points, 1.5 rebounds, and 1.2 assists coming off the bench in 25 Euroleague games. In the Israeli League, he averaged 8.3 points, 2.3 assists, and 2 rebounds. Haynes played two seasons for the Mavericks (2008-10) after transferring from Boston College. As a senior, the Irving native was named Player of the Year in the Southland Conference and was third in the nation in scoring at 22.6 points per game. The Maverick Open, formerly the Chip-N-Classic, will take place Sept. 10 at Texas Star Golf Course in Euless. Sponsored by the UTA Maverick Club, the tournament raises money for all 14 of the University’s NCAA Division I athletics programs and will help launch the women's golf program for the 2017-18 season. For more information and to reserve your place in the Maverick Open, contact Kris Wood at kriswood@uta.edu or 817-272-9613. • Movin' Mavs track and field athlete Daniel Velasquez won a silver medal in the 100-meter dash and a bronze in the 200 meters at the International Wheelchair and Ambulatory Sports' World Junior Games in Stadskanaal, The Netherlands. Velasquez finished fourth in the shot put and set a personal record. The deadlines for individual sports are badminton, today, Tuesday, July 14; poker, Thursday, July 23; and MavStrong competition, Thursday, Aug. 6.